I am interested in the many old stone-built walls, chambers, piles and cellar holes that dot the New England countryside. The age and origin of some of these sites is a mystery. Some are likely to be fairly recent, but I believe that many of these places date back to the time before Columbus and that some may be truly ancient. Here you will find my photos of a number of different sites in New England. If you have any information to share about any of these places or if you know of any sites not on this list that I could visit please e-mail me. There are literally hundreds of stone chambers in New England. Some of these chambers are very similar to ancient sites in Europe and some believe that they were built by European explorers before Columbus or by Native Americans who had contact with seafaring Europeans. Others believe that some chambers were built by Native Americans for their own indigenous religious and ceremonial purposes. Some claim that all of these structures were built as root cellars or for other agricultural purposes by colonial and postcolonial farmers, and certainly some New England chambers were built or used as root cellars. Carbon dating of charcoal recovered at excavations at some sites has yielded dates from thousands of years ago. I believe that many chambers were built at different times by different people for different reasons but my interpretation of the available evidence is that some chambers were very likely built by Native Americans in prehistoric times and that some may be among the oldest structures in the New World. Acton MA "Potato Cave" A chamber on conservation land. Bridgewater MA This is a fairly large stone chamber near Lake Nippenicket in Bridgewater that appears to have been either built or modified in historic times, possibly for use as an ice house. E. Brookfield MA A small vaulted root cellar. 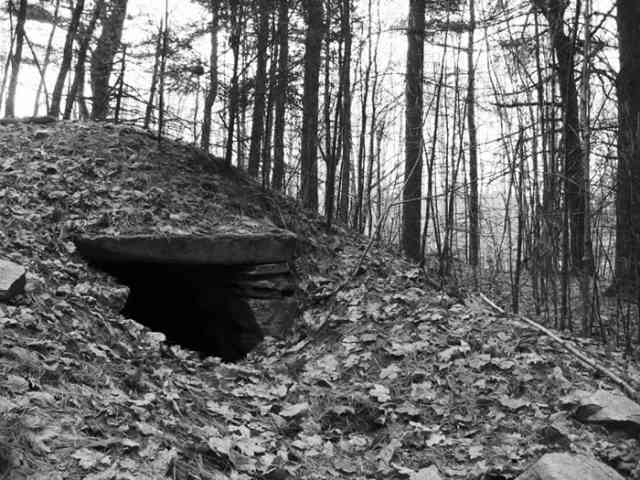 Stone arched root cellars are fairly rare in New England. Burlington MA A small chamber built into a massive stone wall. For more detailed information and interpretation of this site please visit Stone Structures. Danbury NH structure A small chamber-like structure near a road in Danbury NH. Easton MA A small chamber near a lake in Borderland State Park. Foster RI Three small chambers, stone piles and other interesting features at an abandoned farm site. N. Grosvenordale CT A unique chamber on private property with two rooms inside. Ledyard CT A large chamber on private property. Leicester MA "Potato Cellar" A small round chamber on private property. A town history refers to this chamber as a "potato cellar." Leicester MA "Airport Chamber" A small rectangular chamber near old foundations on an abandoned road near the Worcester Airport. Littleton MA forest chamber A small chamber and other stonework on conservation land. Montville CT Chamber Montville Connecticut is a town rich with interesting stone structures and ruins. This small chamber is on private property. The landowner told me that the land has been in his family for centuries and that as far as he knows, the chamber has always been there. Montville CT Chamber- Gardner Lake Stone chamber and historic stonework near the shore of Gardner Lake in Montville. Montville CT "Complex" Two stone chambers and other enigmatic stone ruins cover a large area on a hilltop in Montville. Montville CT "Soutterain" Chamber This chamber is a narrow tunnel that extends 38 feet into a hillside. The chamber was discovered in 1938 when a hurricane uprooted an old tree that collapsed part of the tunnel near the entrance. This structure bears strong similarities to some prehistoric structures in Europe. New Salem MA The "Bear's Den," a fairly large chamber. For more detailed information please visit Stone Structures. Norton MA A stone chamber and terrace built into a walled enclosure in a hillside. Norwich VT A collapsed stone chamber asociated with walls and other ruins in the woods. Pelham MA A small round chamber near an old cemetery. Petersham MA A partially ruined stone chamber of unknown origin. S. Royalton VT There are a number of stone chambers in the South Royalton VT area. This is a locally well-known underground chamber not far from the Joseph Smith Birthplace Memorial. Spencer MA A large rectangular chamber. E. Thompson CT The "Hermit Cave" is a small corbeled stone chamber. Webster MA This well-preserved stone chamber on private property in Webster is located near a stream bed and a former Indian trail. Members of the Nipmuc tribe today believe that this chamber was built by their ancestors. Wendell MA Two small "twin chambers" located near a road and house foundation. Offerings found inside may indicate recent Native American use of this site. For more detailed information and interpretation of this site please visit Stone Structures. Upton MA "Cave" This is a very well-known and impressive man-made stone chamber which many have argued was built in prehistoric times. There are likely many thousands of stone piles in New England in a wide variety of locations. Similar sites can be found throughout the area where Algonquin-speaking Indians lived. Some of these piles have been shown through excavation to be prehistoric and many believe that some of these piles are Native American ceremonial structures. Peter Waksman has a fantastic blog with information about these sites at Rock Piles. Attleboro MA Stone piles in a tiny patch of woods, on a rocky slope next to a stream. Chesterfield NH Stone piles, walls and other features I spotted near a mountaintop in Pisgah State Park. Douglas MA A variety of features in the Douglas State Forest. Dunbarton NH Stone piles and other structures. Glocester RI I was thrilled to stumble upon this site with many well-built stone piles, the chamber-like "Shepherd Hut" and many other interesting features. Haydenville MA Stone piles and other walls on and near hilltops and streams. Lakeville MA Stone piles and other features near a historic "Indian Burial Ground" close to Long Pond. Montville CT Well-built stone piles and other features near the "Souterrain" chamber. Montville CT Rock Shelter Site A site on private property in Montville CT with rock outcrops with shelters and caves rising above a wetland with stone rows and piles. Southborough MA This property owned by EMC Corporation and currently slated for destruction features numerous well-built rock piles and stone rows on hills near a wetland. Wyoming RI Stone piles aligned in rows near a swamp in the woods of Wyoming RI. Other historic and prehistoric lithic sites. Bellows Falls VT Prehistoric Native American petroglyphs. Foxboro State Forest MA A variety of stone features in the state forest including perched boulders, "prayer seats" and more. Foxboro State Forest Stone Sites has more information on these and other sites in the forest. Franklin MA "Indian Fort" A complex of walls, earthworks, balanced boulders and other features near a wetland. Some of these walls may have been built in modern times but there are possible indications of a Native American presence here as well. Lakeville MA "Indian Burial Ground" A very small cemetery with headstones (mostly unmarked fieldstones), near Long Pond. Lowell-Dracut-Tyngsboro State Forest, Massachusetts A site with rock piles and other features near ponds in the forest. Leicester MA Historic stonework in the woods of Leicester. Middleboro MA "Hand Rock" On "Indian Hill," a Native American petroglyph of a hand and wrist. Pomfret CT Cellar holes, walls, and more unusual stone features at the abandoned settlement of Bara-Hack. Morrill's Point Mound, Salisbury MA An ancient burial mound of the "Red Paint People." "King Philip's Cave," Sharon MA A rock shelter that some believe was used by Indians for ceremonial purposes. Waterford CT Farm Erratics and walls on an old farm site. W. Brookfield MA "Rock House" A rock shelter used by prehistoric Indians. Wrentham MA - Birchwold Farm Stone walls and ruins on an abandoned dairy farm.